The Berkman Center for Internet & Society at Harvard University and the Wharton School of the University of Pennsylvania bring together academics and policy analysts to consider the implications of the recent FCC decision to opt for a “third way” in asserting its jurisdiction to implement policy for broadband service to U.S. homes. Click Above for Video…or download the OGG video format! Kevin Werbach: I’m Kevin Werbach. I know many of you. I am a professor at the Wharton School of the University of Pennsylvania. I also in full disclosure have a consulting engagement with the FCC but here, I’m speaking purely on my own. This is an event that is jointly hosted by the Wharton School and by Berkman Center for Internet and Society at Harvard University. My colleague, Yochai Benkler, is the co-organizer of the event. He’ll speak in just a minute. Our topic today is the FCC’s authority over broadband internet access. This is a critically important topic. Broadband is at the minimum, one of the great infrastructure projects of our era and in many ways, something much more than that. In many ways, it’s a fundamental platform for the way that we’ll interact and already are interacting with our families, our communities, our work environment, our government. So, the question about the regulation of broadband, the question about how the FCC, Congress, other parts of the Federal Government relate to broadband access? It’s a critically important one in a whole variety of areas as I’m sure all of you know. And the immediate context for this event was the decision in April by the D.C. Circuit Court of Appeals rejecting the FCC’s legal theory for sanctioning Comcast Network management practices for their broadband access service. Shortly after that decision, Yochai and I started talking and our sense was that there was a critical issue here about where things would go forward. A critical open question about what legal authority the FCC had, what trajectory the Commission would take about broadband under the statute and how this would point out. So, we started putting this together. We felt that there were open questions and we needed an event to talk about it. The response has been really outstanding as we will see in a minute. We’ve got an extraordinary group of speakers from a wide range of perspectives here. Subsequent to that, Chairman Genachowski at the FCC announced his proposal, the so called, Third Way Direction to Move Forward under Title 2 of the statute on broadband authority. And then just this week, the chairman of the major committees in the House and Senate put out an announcement about initiating a look at some of these issues of potentially revamping the Telecommunications Act. So, we’re proud to take full credit for all those developments since we started putting this together. But we felt like there were still some open questions. There’s still some very important issues both about the legal dimensions of how things go forward as well as the substance. So, that’s what we’re here to talk about today. I want to welcome all of you. I’m going to moderate both of the sessions. I’ll just bring up my co-host, Yochai Benkler, to say a few introductory words then we’ll go into the first panel. Yochai Benkler: So, you have this? So, first of all, it’s to say welcome to everyone for coming here and to say how pleased we are to be able to co-host this with the Wharton School and with Kevin. The effort to try to come from academia and provide a platform for an objective and diversitive use about a set of questions as I think something that we both were trying to do and I think is important because these are, as Kevin said, really important issues. The only piece of context that I’d like to add is to zoom to the 10-year level instead of to the 3 months or 4 four months level and to understand that one of the things that’s happening that is involved in the transition that we’re in now is that we’re in a decadal moment in a sense, somewhat akin to the first broadband transition from dial-up to broadband when we talk about next generation networks. And whether it’s that the speeds of the wired connections are massively greater that the investments structure [Indiscernible] [0:04:44] fiber is different and requires new investments that are different and perhaps different on both sides whether it’s the question of the degree to which at long last wireless and ubiquitous access will really replace and displace. These are the questions that come together with this idea of next generation connectivity that is seen to be quite widely by people looking at policy to be a phase change like the first broadband transition ones. And so, in the context of this moment that is both in the market and the technology of phase shift and in the politics potentially a phase shift, being able to provide a platform for talking about whether the FCC should or shouldn’t, can or can’t seem to us to be a good idea on this longer term. And so, thrilled to have everyone here and thrilled to have this collaboration to do it with. Kevin Werbach: Terrific. So, a couple of housekeeping notes, please put your mobile phones on stun, and we are recording this. We’re not streaming the video live. We are recording the video and we’ll make it available on our website. So, we will take questions for both of the panels. When we take questions, we’ll have to ask you to wait until the mic comes around so we get you on the video. So, without further ado, let me bring up the first panel and then we’ll get started. So, as both Yochai and I said, we’re really thrilled to have a group of people who are experts on these issues as well as in many cases, people who have a firsthand knowledge and involved in the development of the debate around the FCC and broadband for many years. In some ways, this is an issue that’s come to ahead in the last few months but it has a history that foes back at least 15 years at the FCC in terms of walking at the question of the internet and how it relates to the FCC’s regulatory authority under the statute and in some ways, well before that. So, the first panel, we wanted to look at the history and context of the debate because it’s easy if you’re focused on the immediate political fights to think that this is something that just spring up yesterday. But the history is important and I think it will inform some of the discussions about where we should go forward. The three people we have on the panel, I’ll just briefly introduce them. I know many of you know – know them very well. John Nakahata is a partner at the D.C. law firm of Wiltshire & Grannis where he practices in telecommunications, internet and cable regulation. He spent several years at the FCC between 1995 and 1998. And his bio actually says, he was one of the principal architects of the FCC’s implementation of 1996 Telecom Act so we have John to blame for any of these problems. He served in a number of roles at the Commission including Chief of Staff for then Chairman Bill Kennard, which was at – one of the turning points when some of the questions about broadband first started to come out of the agency’s radar screen. Next to John, we have Jessica Rosenworcel. Jessica also spent time at the Commission in the Wireline Bureau and then as a legal adviser to Commissioner Michael Copps. And now serves as the Senior Telecommunications Council to the US Senate Commerce Committee which oversees the FCC. And finally to her left, John Windhausen. John actually, I didn’t realize it turns out was at the Commission as well in the 1980s. I first encountered him subsequently when he was in Congress working as a counsel to the Democrats on the Senate Commerce Committee during the period in which the 1996 Telecom Act was drafted. So, John was actually involved in the drafting of the statute that still applies today. So, if this John is not at fault, then you certainly are. Subsequently, John served as General Counsel at the Competition Policy Institute and President of the Association of the Local Telecommunications Service and now, has a private consulting firm. So, let me start by asking a question to all three of you then we can take it into our [Indiscernible] [0:09:22]. We’ll start with John. So here we are, 14 years after the 1996 Telecom Act. At a point in time when broadband is not just something that’s available to a few people but is something that a majority of Americans I believe at this point subscribe to. How is it that we’ve gotten to this point that we’re still debating this basic initial question about the FCC legal authority? Kevin Werbach: Oh, I guess John Nakahata. I’m sorry, bad, bad panelist selection. John Nakahata: Actually, it might makes sense to start with John Windhausen but the – because of the – in some ways, the reason why we’re debating it goes back to the – I think it goes back to the statute and goes back to the fact that the Act itself wasn’t written at a time when the internet is something – we didn’t have – we didn’t have the internet as we knew it. It was something that was primarily drafted. I mean, a lot of the drafting of the Telecom Act incurs in the 1993-94 timeframe, which to put that in internet context is roughly coincidental with the introduction of the internet browser. So, I mean, it’s different – the Telecom Act is a creature of a different world. And that became pretty apparent pretty quickly as the FCC began preemptive – try to grapple with how do you apply statutory – how do you apply the statutory definitions to the world of the internet? And not surprisingly, there were two different views coming out of the Congress and if you wanted to define the – find the definition of being in a bad position in Washington terms, the FCC was caught in the [Indiscernible] [0:11:13] between a very deregulatory Commerce Committee Chairman, Senator McCain, who said, “Well, I think that these internet services are info – should be treated as unregulated services.” And a very universal service concern, Chairman of the Appropriations Committee, Senator Stevens who took the view that in fact, any internet services or that these – as far as internet access services and really even things like e-mail all involve transmission and so, involve the provision of transmission to the public and therefore with telecommunication services. So, the question has always come down to what – the question we’ve been – the reason we’ve been dealing with these questions for 14 years and that they’re unresolved is that they’ve been or in some ways, got resolved and then have been unresolved since then or re-unresolved is that there – is that the statute didn’t speak to it and that the answers are not – are neither obvious nor clearly spelled out. Kevin Werbach: John Windhausen, is that your recollection too? John Windhausen: Well, yes and no. I’ll introduce a different perspective on it right away perhaps for the sake of debate. The way I see this – well, let me – let me say – put it this way, the debate that we’re talking about now really started 30, 35 years ago as the FCC struggled with this decision about how to separate the regulated telecommunications or communications functions from the unregulated enhanced services, information services that was started really in the 1970s with the Computer One then Computer Two and then Computer Three decisions. And I suspect that we’re still going to be debating those questions even 30, 35 years from now because I think what we’ve got here and stopping back trying to look at a bigger picture, we’ve got two very important principles that we all agree on I think in terms of the principles. One is that you need to have the principle of common carriers which I know take some hits as 19th century holdover and actually goes back much further than that in history and the reason it goes back is it’s sort of in my view in the category not the same but it’s in the same category as things like free speech in first amendment. It’s a fundamental principle that if you’re going to be offering communications to the general public, you ought to do so in a non-discriminatory way. So, that’s one important principle. There’s another very equally important principle which is that you don’t need to regulate stuff that doesn’t need to be regulated. So, if you’ve got information services that are being offered on a competitive basis and there are low barriers to entry and anyone entrepreneurs can fit into that marketplace, well, you don’t need to regulate that set of services. And that – those two principles are equally strong, equally valid and the question I think that the FCC started to investigate 30, 35 years ago was how do you draw the boundary line between those? The 1996 Act really tried to capture that debate and I – and it’s very consistent with the computer inquiry lines of decisions and I think you could say that the debate that we’re having now, the reason that we’re still debating these issues is that issue of how do you draw that boundary line is still relevant today. So, one way I look at the current debate as we’re now embarked on Computer Four. Kevin Werbach: Jessica, your turn. Jessica Rosenworcel: Well, let me put it more simply from a legislative perspective. Technology just moves at such a fast clip right now that our legislative and regulatory models, they struggle to keep pace. And you can imagine that when the Telecommunications Act was written, there was no one who was really contemplating the ubiquity of broadband service. There was probably nobody who thought that there would be 280 some odd million wireless handsets available in the marketplace and consumer’s hands or that in their palms, they’d be able to access the internet. Much less that the computer screen would be fusing with the television screen. And all of those changes are tremendously exciting for consumers but they pose significant challenges for regulators and legislators and that’s what really what we’re struggling with right now. Kevin Werbach: Let me just push on that. Is it – I mean, it’s certainly true that Congress is not a professional futurist society and even some of us who were very tech savvy and in the mid 1990s didn’t anticipate everything that was going to happen but I mean, is it really the case that this world is totally foreign to anything that Congress could have imagined? John Windhausen: Let’s again go back to the 1996 Act a little bit and sort of set the stage here. A lot of what happened in the lead up to the 1996 Act, we have to keep in mind, was the effort to take communications policy away from Judge Greene. And so, predominant motivational force behind the 1996 Act was to say that the Court should not be running communications policy, it really should be the expert government agency, the FCC. And this was again, one of those universal things that applied across the boundary lines, Republican and Democrats, if there is one thing that everybody agreed on, it’s the Congress and the FCC should be making policy not a Federal – a single Federal Judge. So, you had so many members of Congress saying from both sides of the isle that the FCC is the expert agency. We really need to have restored the authority back with the FCC because they are the ones that have the technical expertise. You know how it is in Congress, you start saying this enough over and over again, you actually begin to believe it. And so, you had members on both sides of the isle saying that the FCC was the proper location to restore this authority and to be making these technical decisions. It’s not a place that Congress is very capable of addressing changes in technology. And so, yes there are huge technological developments that occurred since 1996 Act to today. What we were trying to do in the 1996 Act is to reclassify [Phonetic] [0:17:36] some of those basic principles that would carry us forward into the next century so that we wouldn’t have to keep going back to Congress for legislative changes every few years based on technological changes. What we wanted to do is to give the FCC the authority to exercise its judgment about how those technological changes should fit within the policy frame that was being set up. So Kevin, I don’t know if that exactly answers your question but that’s hopefully a better perspective. Kevin Werbach: Anyone else have a perspective on that? John Nakahata: I don’t know that it couldn’t have been foreseen but there were certainly roads not taken. And so, if we – I mean, if we think back to the 1994-95 timeframe, clearly in the air was the notion that the tele – that the existing communications are structure, to put it in more – to be more – well, this parlance that Kevin created, was more oriented towards silos of applications then indent than layers of functionality. And so, you didn’t – it didn’t – I mean, when Computer Two – the computer inquiry decisions I think were very much premised on the notion of trying to separate a transmissional layer which would be a basic layer and sort of become a carrier service from an application’s layer which would be the information on enhanced service that wasn’t totally mirrored in the structure of the Act and particularly in the focus on common carriers. And the cable industry in some ways, leapfrog the development of the regulation because the cable industry as a non-common carrier, being offering an integrated transmission and information service combination. The road not taken at the time was it sort of early on, Vice President Gore floated the notion of Title Seven and do you need to sort of recreate with – would there need to be a different set of statutory provisions, and I’m not saying that he’s necessarily were right but I mean, but a different set of statutory provisions that would apply to a – sort of even IT is probably not the right word to put on it so even that they sort recasting it looking backwards. But we’ll use that term for now, an IT world where the transmission network would be capable of all different ranges of applications, video, voice, data and that was – that was the road – that was really the road not taken and the choice was – the choice was to main – stay with – stay working within the kind of application-centric framework that was set up by the ‘34 Act. And I think that is – that is what we continue to struggle with today and it’s exactly what, you know, I think – I think you see what the members are saying, we need to go back and look at this again. Kevin Werbach: So, what we did get in the statute was these – these two categories, telecommunications and information service. So, let me just ask you, how – what do you make of – what did those mean? Fundamentally, what’s the import of that distinction? John Nakahata: Well, it gets back to that fundamental – these two principles that I talked about earlier about what should be and should not be regulated. You know, we did base the decisions and the definitions of telecommunication services and information services based on the Computer Two and Computer Three lines of decisions coming out of the FCC. I know a lot of people said, “Well, why didn’t you use basic and enhanced, as the terminology then? Why did you use the telecommunication services and information services language?” Because – and the reason is because we were abrogating the MMFJ. We were abrogating the Court decision that used those terms. So, we had to use that terminology so that it was clear that we were taking the authority away from the judge but we also wanted to use the definitions that the FCC had used because we were handing it to the FCC. We wanted to build on the body of work that the FCC had done so far and that was effort to try to identify those two lines of thought. I know that we – there are some vague provisions in the 1996 Act, I will agree to that and certainly, we start taking some hits from that, about that and including from the Supreme Court but I would also say that some of that was not just oversight that it was actually intentional on our part not to decide some of these questions because again, we did want to leave these to the FCC so that it could adapt it’s regulatory process to the changes in technology. And so – but those two competing – those two terms really capture the two different philosophies, those different core beliefs that are again I think are both accurate and valid and why that debate is going to continue probably not just now but for many years to come. Kevin Werbach: Jessica, I mean, do you think it’s a fundamental distinction or something specific to the statute? Jessica Rosenworcel: Well, as John mentioned, you can go back to Computer Two to look for the distinction between basic and enhanced services which was roughly mirrored in the Telecommunications Act with telecommunication services and information services. And that construct has been useful but as we approach a world where we have many more services, many more service providers, we are seeing a degree of functional integration that is making the application of those two binary constructs much more difficult. And I think that’s what we’re grappling with right now. John Windhausen: I would just add in a note that I think John got it right with the Stevens’ report that interpreted the statutory provisions when the Stevens’ report issued by the FCC came out and said yes, the 1996 Act terms were meant to build off of the Computer Two and Computer Three lines of decision. Kevin Werbach: Yes, that’s a good segue. I mean, do you want to jump in but I wanted to get into sort of now, let’s talk, let’s move forward how the FCC has interpreted this or do you want to say something first, John? Kevin Werbach: Okay. So, let me start with you then. So, in 1997, the FCC issued the so called Stevens’ report, report to Congress and then ultimately began the process of classifying broadband services. When you were there under Kennard, started the process of looking at cable-modem service and then completed the decision under Chairman Al and Chairman Mon [Indiscernible] [0:24:22]. So, what was – what was the agency trying to accomplish and what was the agency concerned about in going down that path? John Nakahata: Well, I mean the context that Stevens’ report came obviously – it’s called the Stevens’ report because it was created by an Appropriations writer authored by Senator Stevens who’s focus very much was on the universal service and maintaining the stability of the universal service fund and who was very concerned and who’s staff was very concerned that if the scope of services on which universal service was assessed was not extremely broad that technology would find ways to flow around those definitions and ultimately, the scope of assessed services would shrink. Not an unreasonable concern. In fact, it’s probably been proved out to some extent but – and it was predictable also, frankly. So, that was sort of what was the motivating concern but the larger issue was what John – what John Windhausen I think was reverting to too. We had – there was a very strong notion that the internet was growing up in an – in a fairly unregulated space. And that that was a good thing. It was a lot of – there was a lot of room [Phonetic] [0:25:51]. People did not need to ask permission to launch new internet ser – internet-based services. The other part of it that was positive was from Paul Polski’s perspective really was internationally, this was a force that was breaking down the power of the PTT, the international PTTs. John Nakahata: The government on Posting and Telecommunication Services in monopolies – the national monopolies in each country. And I think if you remember back to the early ‘90s, international calling was extremely expensive. And there were many different ways that international calling was – calling rates were brought down including some efforts by the FCC in terms of sort of force suing the US as volume of traffic as a way to force down lower call settlement rates. But another reas – part of that was opening up all – lots of different alternatives whether it would resale or the internet as ways to flow around the facilities that were created by the national monopolies. And it’s not at all surprising that VOIP service for example, and in the Stevens’ report talks about – if you remember, a company called IDT. And what IDT was doing was providing a way for people and not unlike Skype today, was providing a way for people to talk to friends and business associates in other countries using the internet and going around the national PTT structure and the international settlement structure. That was something that that was important to maintain. It was an important downward pressure on an artificial monopoly structure that was propped up through the ITU. And frankly also, it was important to maintain this – the other part about the internet is that it’s value-added services are not being subject to national licensing regimes. People were trying – were entering and getting into countries without having to get governmental approval. That was a democratizing force. You know, you do not need to get the permission of the government necessarily to bring in the internet. That was all – these were all benefits of having it be unregulated – the internet being an unregulated service. Now, none of this was really fully doctrinally resolved, right? As I said, the notion of Computer Two was you had a regulated transmission layer and that was a common carrier service and you had an unregulated information services, application’s layer that rode over the transmission layer that was – but anybody could buy the transmission layer from the basic – from the basic service provider. And that was a very simple and eloquent concept and construct. The problem was that – the problem was it didn’t necessarily match reality, that there were certainly transmission providers that were not common carriers, cable being the most prominent example among them but not the only example, the other example being the internet backroom providers. So, the Commission says, “Well, if we’re going to declare all transmission to be common carriers …” which was the point of view that was being pushed by Senator Stevens and Burns at that point in time is based to fairly unpalatable choice of – then, are we saying that anybody who moves bets is going to be a common carrier and going to have to get license? Kevin Werbach: Okay. So, essentially, the agency had a choice of saying, either we’re going to pull a whole lot of stuff from the internet up to the level that historically regulated incumbent telephone companies or are we going to take a whole lot of stuff and push it down to this likely unregulated tear of what’s under information services? John Nakahata: That’s from a statutory classification perspective, yes. The interesting thing was, the answer by Senator Stevens and Burns was in fact, the third way. So, if you look at paragraph 47 of the Stevens’ report, it’s in response to this concern. Senator Stevens and Burns maintained that the Commission could rely on its forbearance authority under Section 10 to resolve any such problems. It sounds awfully familiar. Kevin Werbach: Never a good idea. Kevin Werbach: Alright. Well, let me ask the other two people on the panel for your take on this. Do you think that there were – the same issue that we were dealing with then? John Windhausen: I mean, it’s very similar. It’s just an upgrade with the technology and the technology is going to continue to change so I think we’re still going to be trying to answer these questions in the future. It is interesting though to go down memory lane and revisit some of those debates at the time that the Stevens report was being discussed because then you were in a situation where all of the telephone industry was asking the FCC to regulate the internet because of this concern about VOIP that John referred to not just internationally but also, domestically. VOIP carriers were seen as providing a very similar service to traditional telephone service and yet, they weren’t paying universal service charges in the same way that traditional phone companies were. So, there was a lot of effort to – by the industry to say, assert regulatory jurisdiction here over voice-over the internet technology. So, these things tend to go in cycles around and around, you know, even back further, there was something called the inter-span service that AT&T was offering in the ‘70s where it was co-mingling common carriers services with the processing services and the question was, well how should that be regulated? Is there a contamination theory here that should say, as soon as you attach a single information service to a telecom component that the whole thing becomes information services? Well, we know that the FCC rejected that and maybe one example of why is for instance, voicemail. You know, you wouldn’t want to take a basic pure telephone service and slot voicemail on to it and then say, “Okay. Now, the whole thing is unregulated.” But yet on the other hand, if you are integrating telecommunications just as a sub component to an overall information service’s package, at some point, yes, it does become more fitting to move it in the information services a non-regulated category. So, that’s why these issues keep, you know, have a long history and they’re going to continue to have a future with this as well. Jessica Rosenworcel: I think what you hear thematically is that there is an effort to try despite the statute to treat like services the same. And when you look back over the last decade, you see in 2002, the FCC classified cable-modem services as an information service and then on the heels of the Brand X decision from the Supreme Court just to reclassify wireline broadband information access services and information service and then subsequently did something similar in 2006 with broadband over powerline and then walked over to the wireless side and did the same in 2007. So, there was an effort notwithstanding the statute to try to treat similar services the same particularly if they are fungible from the consumer perspective but it is challenging because the statute was not built for that kind of treatment. And so, there is an effort to try to figure out how to harmonize these services and their treatment perhaps and despite what the law actually calls for as it was enacted. Kevin Werbach: So, what if anything has changed? I mean, John mentioned one thing in the environment in terms of the concern particularly in the late ‘90s about the international [Indiscernible] [0:34:23] what the FCC might do. Clearly, technology has advanced. Broadband is more widespread. Are there any differences fundamentally from when the FCC was initially considering this or not? John Windhausen: Well, the marketplace continues to change, sure. And one of the evaluations that the FCC has to be engaged in is a continual analysis of that marketplace to see where the market cower maybe, where there is an opportunity for certain providers to gain an unfair advantage in the marketplace or discriminate against others. That is a constantly changing analysis that has to be done. So – and John Nakahata is right. In some ways, that we didn’t really have a full understanding in 1996 of what the internet was going to be and what the technology is. Now, it wasn’t that we were clueless at that stage. I do remember when we passed the Telecom Act out of the Senate in 1995 where we dealt with long distance entry and abrogating the MMFJ and burglar alarms and HDTV and all these hundreds of provisions. The headline in the Washington Post when the Act passed the Senate was, the Senate Acts to Regulate Indecency on the Internet. That was the headline. That was the one thing that the Washington Post picked out and it was very clearly that, you know, we knew the internet was there, we didn’t know about broadband but we did have a Section 706 which began to sort of talk about advanced services. So, we had an inkling of what was going on and what was going to happen but we didn’t really fully appreciate, you know, the tremendous demand for broadband services and the tremendous growth in those services. And so, that is what’s changed. I mean, we need to really have a regulatory regime that does respect the fact that broadband is well, taking over the world. That’s probably too strong but it is going to become the predominant way of communicating in the future. Kevin Werbach: So, one thing that is changed at least in the regulatory structure is we talked about Computer Two and Computer Three and those rules, those FCC rules were enforced when these decisions were made in the late ‘90s and at large, we’ve been abandoned. The FCC also chose to eliminate line sharing requirements in the 2003 [Indiscernible] [0:36:51] training. Did any of those changes make a substantial difference in terms of the context for deciding this broadband authority question? John Nakahata: I’m not sure whether those things make a clear of it. It does shape the doctrinal discussion a little bit in a sense that there is no – going back to the definition of common carrier services thing which everybody is – of this famously circular but even in the D.C. Circuits articulation of it, one of the prongs for being a common carrier service is that you are required to be a common carrier service, which always struck me as being the ultimate in the circular too, is that there is nobody – there is nobody who’s really required to provide transmission on a standalone basis anymore. You can elect to provide it – you can elect to provide it on a standalone basis or you can choose to provide it on an integrated basis and that’s probably – that’s traditionally different than in 1989. But the other difference – clear difference in the marketplace is or maybe not difference, evolution in the market was maybe a better way to put it, is the robustness of multiple facilities-based players both on the wire – on the wired side but with cable sort of emerging and will actually being the predominant broadband medium but also, it was a significant development on the telephone – on the traditional telecom side. And then with the growth of wireless services which substitute to some – to at least some extent. Kevin Werbach: Jessica, your view on it? Okay. Well then, let’s fast forward a little bit. So, as I believe Jessica mentioned, in 2005, the Supreme Court decided the Brand X case, upholds the agency’s classification decision as an information service. What’s the impact of that decision today? What – does that tell us about the authority the Commission has and what it tells us about the authority of the Commission doesn’t have? Jessica, you want to take your side of it? Jessica Rosenworcel: Well, certainly it’s a Supreme Court decision so we hope that the FCC will pay heed. I felt duty bound to say that. But I suspect it can be read in different ways too. There are probably people who look at it on the one hand as suggesting that it is more logical to look at these services as functionally integrated. And on the other hand, there will be people who look at it as chiefly as Chevron decision and defines the outer boundaries of appropriate decision-making by the FCC. In either case, I’m sure it’s going to influence the way both the FCC and the Congress to move ahead as they try to identify a way forward for all these issues. John Windhausen: Kevin, I don’t have too much to add to what Jessica had said. I mean, it is – it did – the majority opinion very clearly said this was a Chevron analysis where they were deferring to the FCC and its analysis and its judgment about how these boundary lines should be drawn. It is kind of just as a footnote, very interesting to see how many people are quoting Scalia’s Dissent from that decision as if that was the majority opinion and he certainly put it much more colorfully in his writing than the majority did. So, it certainly deserves more air time given the language that he used. It’s more fun to read the dissent but the dissent did not carry the day in that instance but having said that, if the FCC changes its mind and seems to have what the majority seem to say is as long as the FCC was making a reasonable decision based on its analysis of the marketplace that it would defer to the FCC’s judgment which then opens the door to the question, will can the FCC then change direction or alter that boundary line and drive in a slightly different place based on an update of its analysis? And I think there is an argument that the Supreme Court decision would allow the FCC to do that but again, within boundary lines. I mean, they can’t totally wipe out and start from a clean slate. I would suggest the Supreme Court and all the courts are going to look to see whether the FCC can build upon the body work that it’s done so far and make adjustments to that based on changes in the marketplace since then. Kevin Werbach: Yes. And that’s – I mean, I think we’ll get on the second panel into some more of these questions about the proposed where it’s going forward. But I just want to try to make sure we complete the story in terms of how this has evolved. Chairman Genachowski in announcing this third way proposal said, that – to paraphrase it, there’s been a longstanding consensus, some sort of [Indiscernible] [0:41:53] consensus essentially that there’s some baseline rules that should apply to broadband access service and perhaps some similar services but the FCC shouldn’t regulate too much and apply the full pan of way of common carriers rules. Is that right? Is there – is there some core that we can look to and say, well, we may disagree fundamentally about how to get there and whether the legislation needed or so forth but there’s some level of consensus or is that even saying too much? John Windhausen: Well, the Computer Two and Computer Three lines of decision do seem to establish a precedent for the third way. Again, it’s not an exact situation because the technology has changed but if you – those lines of decisions from the FCC do seem to say that you can separate out the transmission component from the information services component and that’s what Computer Two did with structural separation, Computer Three did with O&A and CEI plan. So, what they were trying to do is to say yes, the bill companies could provide an integrated package of information services and telecom services but they also had to offer the telecom services component separately as a standalone measure to competing information service providers. So, that seems to be at, you know, at a very high level the kind of precedent that might be valuable and useful for the FCC to refer back to and the Chairman Genachowski to look back to as he crafts this third way. Now again, it has to be updated with the new technology and it can’t just be a complete replacement or rather complete, you know, taking from the past and moving it automatically to the present. But there is a principle there. There is a germ of a thought of yes, you can separate out the telecom functions from the information services functions. John Nakahata: But I think doctrinally, that’s actually a more revolutionary step than maybe John’s characterizing it here because the core germ of – one of the core parts of the computer decisions [Indiscernible] [0:44:13] decisions certainly follow through in the post ’96 Act jurisprudence was that the notion of telecommunications services and information services are mutually exclusive categories. You are one of the other but you’re not both. And in some ways, that is actually the seminal point in the jurisprudence and that it’s not a – that’s not a statute – I mean, the Commission interpreted the statute that way but it interpreted the statute that it was not – it’s not spell down in the statute that way. There were versions of the Communications Act or what became the ‘96 Act that did in fact, spell it out and those provisions were dropped ultimately. But you know, it’s over turning that point, can you be sort of keyed up directly here which is can you be both a tele – are you, not can you but are you both a common carrier and an information provider when you offer an integrated internet access service to the public at large? Kevin Werbach: Hey Jessica, you left the deal with all of the [Indiscernible] [0:45:26] so therefore I’m curious – limited what you can say but do you have a sense that there is a room for a consensus somewhere in the middle here? Jessica Rosenworcel: I think when you push all the political rhetoric aside, what you’ll find is nobody no matter where they sit on this debate is really interested in applying a series of old style telephone rules to new fangled broadband services. The important thing in the end is to identify not so much which title all of these services fit in as what your principles and priorities are as we head into this new communications world. How do we make sure that broadband is ubiquitous? How do we make sure that consumers are protected? How do we make sure that public safety officials for instance have access to the networks they need? And then separately, how do we make sure that we provide proper incentives for private investment? And those principles probably should guide our dialog more than some deeply embedded notion of what title these services best belong and. And so, that’s I think what we bring to it from the legislative perspective right now or at least with my boss, we do. Kevin Werbach: Alright. So, I’m going to – I’m going to start and invite people to ask questions from the audience. We’ll get a microphone to come around. Let’s see. While we’re doing it, let me just ask you one follow-up question guys I may have to ask. So, there was this announcement on Monday by your boss and the other committee chairman, what can you say about – where did that process come from and where is it likely to go? 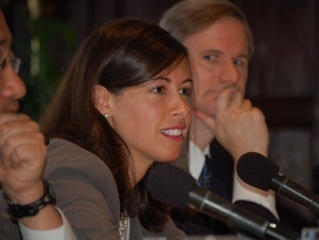 Jessica Rosenworcel: Well, if April is not the cruelest month, it’s a complicated month for anyone who follows telecommunications policy and obviously, in the aftermath of the Comcast decision, a lot of time, energy, and effort has been expended at trying to identify just how the FCC should manage what that decision says and how it should look to broadband services in the future especially in light of their recent efforts with the National Broadband Plan. So, it was the thinking of what I would say are the four majority leaders in the Congress on these issues which would be Senator Rockefeller, Senator Kerry on the Senate side, Congressman Waxman and Congressman [Indiscernible] [0:47:39] on the House side that they would harness all this energy and try to bring it into a single and more thoughtful forum so that we could work to identify ways both small and large that we could update the Communications Act. Now, that’s clearly not a simple or easy task but it is something that we think is compelled by the evolution of technology and has been accelerated by that Comcast decision. Kevin Werbach: Get the mic up here at Chris and then we’ll get – I’ll get back to you and then we’ll in a sec, sir. So yes, and just state your name and affiliation for the record. Yes, thanks. Chris Savage: I’m Chris Savage. I’m with Davis Wright Tremaine which is a law firm but I’m not here on behalf of any particular client. I’d like to ask the panel a question that is probably boring and difficult as compared to interesting and fun, which is as a practicing lawyer, all this policy stuff is great but I’ve got this statute sitting in front of me and I guess I’d like the panel’s view of suppose we don’t change the law and it’s just what is it, do you guys have any thoughts now that we understand more about how the internet works as to whether or not internet transmission is or isn’t a telecom service? John Windhausen: I’m not going to be able to help you, Chris. I’m sorry. John Windhausen: I charge people with my answers but he was trying to get it for free. John Windhausen: But seriously, the question is let’s assume there is going to be, you know, by 2012 a comprehensive thoughtful rewrite of the Act that deals with all this, nonetheless, we have a year or two of dealing with the laws that exist today. And I’m just very curious about people’s thoughts about that because that’s – when I go back to the office, what I got to deal with [Indiscernible] [0:49:39] today. John Nakahata: And I think it’s a bit of a judgment call. I don’t think it’s a black and white question. And I’ve seen some of the discussion about DNS lookup services being – they were initially categorized as an information service type of thing but then you can make the argument that’s very similar to telephone numbers and routing basic common carrier features. So – and 800 numbers, yes. But I’m not qualified to weigh on it. I’m sorry. Kevin Werbach: I think the answer doctrinally is pretty straightforward. Internet transmission or internet service – internet transmission is not a telecommunication service. That’s what the FCC help update with DNS and other aspects of internet access are not on telecommunications service whether the FCC changes its mind, there’s a different – different question. There is obviously a lot of difficult boundary cases. The FCC is considering right now whether MPLS’s type services should be considered information services or telecommunications services. And you know – and so under what circumstances or not and that’s where, you know, people come to talk to people and Chris like me all the time. But it’s – you know, that’s doctrinally what we are. I think the question is how – one of the questions opened up by the reopening of the date over definitions is how much of that then gets thrown at [Indiscernible] [0:51:14] and you have to – and you do have to start revisiting those questions all over again. Lincoln: Lincoln [Phonetic] [0:51:23] with Verizon and maybe ironically enough, I can’t tell you what a telecommunication service is either despite the fact that I work for a telecom company. But there is one large elephant in the room, Kevin that I think is been totally ignored by this debate and it happens a lot in these debates and that is that the cable industry was never treated as a common carrier. It always offer integrated service and at one point, it now offers voice service but as far as I know they didn’t offer telecommunication in the early days either. And that gets totally ignored in this debate. Doesn’t that crash into this whole thing in a big way? Isn’t it an important part of it? John Nakahata: I think I said that. I don’t think I ignored it, Lincoln. I think I’ve said that one of the problems is that that the Computer Two kind of stratified that the world into transmission layer which would be a regulated common carrier service and an information service which would be unregulated. And in fact, one of the things that happened is the cable industry leapfrog then and the cable industry is doing both as a non-common carrier service. So yes, it is the elephant in the room but it’s – we know it’s here. Kevin Werbach: Let’s go back to the history and maybe John Windhausen, to what extent was that within the mindset of the Congress in ’96 that it should have providers who are not historically a common carrier is being – offering these kinds of services? John Windhausen: Well actually, you know, theoretically, what we were trying – we were trying to stay technology neutral in the 1996 Act. And so, we were trying to say the same rules should apply to all technologies regardless of your history but it should be more related to your presence in the marketplace. So, for instance, in the – to divert for a second in the Section 251 analysis of the unbundling provisions, you know, there is a very clear assump or not assumption but clearly written into the Act that whether the, in that case, the [Indiscernible] [0:53:12] is using fiber or wireless or other technologies, well, wireless is a title free but regardless of the technologies, you were supposed to comply the unbundling provisions regardless of how the call was routed or what technologies were in particular. So, that was sort of the flavor of the environment that we were trying to get away from the silos, to get away from your history, historical categorization and treat the same services fairly and equally. That was – that was what we were trying to do. Now, did we succeed in doing that entirely? No, I don’t think it was possible to completely succeed. I know the FCC also took that technology-neutral approach as best it could but, you know, it’s difficult to do and you know, it’s a long process to try to get there. John Nakahata: And the web consequences of any statutory classification make that difficult. So, what was one of the input is, I’m not saying that it’s all inputs at all but one of the things that the others, if you say that cable-modem [Indiscernible] [0:54:16] was a telecommunication service, you potentially have immediately – immediate implications for the application of [Indiscernible] attachment raise, right? And universal service and those [Indiscernible] [0:54:28] things that overhang – that overhang some of the debates then and now. Kevin Werbach: So, I saw [Indiscernible] [0:54:35] on the right and then Mark Cooper on the left. Just describe to me where you [Indiscernible]. Scott Leyland: Very accurately. Scott Leyland [Phonetic] [0:54:44] NETCompetition.org. A rather simple question but you know, should the foundation of FCC Regulatory Authority meaning, the interpretation or reinterpretation of definitions should that change like the FCC’s definition of the public interest changes with basically what three votes that the FCC says it is at any given time? John Nakahata: Is that normative question or what? Scott Leyland: [Indiscernible] [0:55:38] the main question is, is it a good policy to change the trajectory of everything, of hundreds of millions of dollars of investment and business models to be exact and then all of a sudden, three votes said no, we’re going to change the trajectory [Indiscernible] [0:55:54]. Kevin Werbach: And I mean, we understand your view and that’s in its part and we’ll get more into this in the second panel. I think we want to try and keep this a little more focused on the backdrop. Yes? Kevin Werbach: I’m sorry, Mark. Just introduce yourself for the recording. Mark Cooper: Mark Cooper, Consumer Federation. The discussion has properly reflect that the actual history of the way this issue has enfolded over ten years, that is, the entire discussion has been about interconnection and carriers or transmission which were the essence of what has gone on. The question I have is that there are at least four other public interest principles in Title 2 that are now clearly implicated, universal service, privacy, access for consumers with disabilities, and consumer protection which in fact have received almost no beating in the regulatory and judicial process that led us to this point in time. If those four issues are now entered either at the regulatory agency or before the courts, how does that change the consideration particularly with the question of changing one’s mind because if the regulatory agency and the courts never considered four fifths of the implications of their decision then you’re really not changing your mind, you’re making it de novo decision in 80% of the issues that the agency should have considered in making the original decision. John Nakahata: Well, I guess I’m not quite sure if the factual premise is right. If you think about the Stevens report, the Stevens report was asked for specifically because of concerns about universal service. I mean, if universal – and the one thing that was front and center in the late ‘90s discussions in addition to issues of non-discrimination which were certainly on the table because of the cable open access that it was going in it sort of either first or first and a half generation. The universal service was clearly there. I do think that the issues like disabilities access have gotten less discussion because – in that context but universal service is clearly been part of the discussion since the beginning. John Nakahata: I guess I would say there’s been lots of examinations of the issue. I think that there have not been a – I mean if inclusion has not been to apply universal service, the assessment of standalone – to standalone – I’m sorry, to integrated offerings of internet access capability but it certainly is something that’s been examined. Kevin Werbach: Let me try and rephrase and redirect a little what I think Mark was going. Should this be predominantly a competition telecom policy debate or should it be broader? I mean, John, you made reference to this sort of very broad kind of two categories of regulation or not which clearly sweeps in a lot of other kinds of issues. Is that the right way for us to be framing it or as Mark [Indiscernible] [01:00:02] that we should take into consideration these broader concerns? John Windhausen: Oh, I think so. I mean, I think that’s an argument that you do need to evaluate the full panoply of provisions and effects on consumers and the marketplace that will result from any attempt to change the definitions or how you apply the definitions. So, in other words, what I’m saying is the court decision, the Comcast case that came out is understandable that the court was only considering that particular facts of that case brought before it and that’s certainly what courts do is evaluate only that but the danger of that court decision is that it did say that it would make this evaluation on a case by case basis. And so, that sets up a process to continue to have to go back to the courts every single time there’s a consumer protection issue or an issue with disabilities or an issue with all the other provisions that Mark just mentioned have to be reevaluated on a case by case basis. Well, that’s a tremendous waste to society as a whole because of all the litigation costs that are incurred. I think what I’m trying to say is that is an argument for the FCC I think, trying to look at the whole piece of this and all the different pieces together in a more comprehensive way to come up with an approach to these regulatory definitions in a way that’s going to make this most sense looking across the board at universal service and disabilities access and the marketplace of all these different kinds of marketplaces. Kevin Werbach: Jessica, do you have any sense of the extent to which those other universal service, private and so forth that will be part of the process on the heel? Jessica Rosenworcel: Yes. I think Mark’s point is that classification has consequences and he’s right. In terms of a legislative perspective, perhaps the interest is less strong and precisely which title of the statute these services fit in than whether or not we create a structure that is capable of delivering the public goods that members care about. Like for instance, universal service, privacy protection, ensuring that the disabled have access to baseline of services and the likes. So, those priorities I think will be more prominent in the legislative process than they’ve been in the recent regulatory discussion. John Windhausen: Anyway Kevin, just another comment if I may. Just as an exercise, I think it’s kind of fun to think back as we’re looking at these issues, not what the 1996 Act contained but what the 1934 Act was all about. Now, go back and put your minds – put yourselves in the minds of the legislator who are drafting that Act which set out the broad parameters of how communications policy should be regulated or not. And you know, it’s an interesting – it can lead us to interesting exercise and interesting thought process. Art Brodsky: Art Brodsky from Public Knowledge. And I’ve actually done that. I don’t know if you remember [Indiscernible] [01:03:05] book that he came out with some years ago which reprinted the – some of the hearings from the ’34 Act and some of that stuff about getting telegraph services at the rural areas and how it was too expensive and they couldn’t possibly do it and talking about reserving public interest spectrum for people other than broadcasters. I mean, it just carries right through. So that – that – I’ve done that exercise and it’s a lot of fun. But that wasn’t the question. The question is I’m fascinated by this tension between on one hand, principles and on the other hand, let’s call it marketplace. On one hand, you have sort of a, you know, relatively timeless non-discrimination principle, you know, call it the 201-202 part and then Jessica, you’re just talking about the need to make sure investment isn’t hampered. How do you – which – does one of those trump the other? Jessica Rosenworcel: I don’t think so but candidly [Indiscernible] [01:04:03] that it is difficult to try to reconcile the two and at least on the Senate side at a 100 senators in it and it’s even more complex. Jessica Rosenworcel: Which is one of the reasons that a lot of these issues do get deferred to a regulatory agency with unelected individuals who can contemplate and think a little bit more deeply about what the right structure should be but we may be reaching the ends of how appropriate it is for them to continue to do that under the current statute. Kevin Werbach: What else? I guess we can go back to Chris and this guy. Chris Savage: I’ll ask a history question then. John, you were there for when Chairman Kennard decided – struggled with this question that we’re struggling with and you said it always comes back. Could you give us more color on why he thought it wasn’t a good idea to apply Title 2 services to information services? John Nakahata: Well, rather than comment on what Bill thought or not thought, since I think the FCC rules don’t allow me to do that and I think what the – what’s laid out in the Stevens report discussion really is a – and you really see through in some of the findings in Section 230 that there a predominant notion that the internet should be left unregulated. And that – that the overall impulse was certainly in the air in the 1989 and it wasn’t – it was, you know, there were good reasons behind it. Some of which we’ve talked about earlier. But also, because the market was evolving incre – the marketplace was evolving incredibly quickly. And the choice at the time was not to go down the road of classifying all transmission as Title – as a Title 2 service and then forbearing. And there were a lot of different types of transmissions that were being offered even then as non-common carrier – in non-common carrier forms and I think that that’s, you know, you have to go back and look at that as a historical context but it’s also, you know. No decisions are made in a vacuum. We did not grow up in a – we did not come up in a world where all transmission was treated as a regulated service and we also did not come up in a world where Congress rewrote, you know, unlike the EEU where there was earlier legislative attempts to try to create a more harmonized regime, you know, that didn’t happen in United States. Kevin Werbach: Yochai, you want to make that question? Indiscernible] [01:06:54]. Yochai Benkler: So, just trying to capture a little bit of what I heard and I think is useful to focus on and then focus you on the one thing that the fifth part of what Mark left out which is competition and what’s changed. If I read John, the story you’re telling, John Windhausen, that I’m – of a trajectory of a basic problem which is to say you have components of the service that are not competitive because of entry barriers, because of a set of classes of stable problems and components that are competitive, enhanced services. At the time, it was also CTE, it was also long distance. And trying to solve that tension between competitive and uncompetitive as a way of not that there is a basic long term tension between non-discrimination and non-regulation but rather that in order to get a well-functioning market, you need to take and separate out those parts of the service that are hard to build a competitive market. And those parts that are easy and try as best you can to narrow your regulation only to those parts that needed in order to allow competition and move away from the others. In that regard, like electricity, we’ve got generation. We’ve got transmission. We’ve got toasters. They’re all connected to the electrical system but we unders – and they all use electricity but we understand them as having different market proposal. So, where I see John Nakahata going into the details of what the argument was here and what was there, it seems to me that there’s a basic line in the historical line that you’re going that there’s this genuinely difficult set of markets to deal with that combined really stably stubborn problems that aren’t amenable to competition and things that are. And that the role of an expert agency unlike something that’s [Indiscernible] [01:09:04] is through look, okay, we try this for a decade. Did it work? Didn’t it work? What percentage of the market has real competition? What doesn’t? Let’s go back and look at it. That’s the trajectory that I’m hearing here and I wonder whether you agree. John Windhausen: Let me see if I understand and reinterpret or maybe put into my own words. So, it’s very difficult to draw that line. Yes, between the two types of markets and the two types of services and categories that we’re talking about. And no matter where you draw the line, they’re going to be some really close calls in judgment calls and people are going to complain on one side if they fall on one side or the other of the line. And those people will say, “Oh, this regulatory thing doesn’t make any sense.” But I would submit that the fact that it’s difficult to draw line doesn’t mean that you should get rid of the line. You know, what that means is that you shouldn’t get – you wouldn’t want to therefore regulate everything and you also wouldn’t want to deregulate everything because if most observers I believe – people can correct me if I’m wrong but I think most observers believe that general Computer Two, Computer Three decisions were very successful in promoting the internet and promoting the availability of enhanced information services because it sets some basic rules of the road that all entrepreneurs and internet providers could get access to the basic network and then build upon it with new and innovative services. So, I think the general framework was the right one. Now, where the exact line you draw is going to be difficult and going to lead to litigation and debates and frustration for those who are right on that line. But in general, stepping back, looking at the big picture, you know, I think there is value in drawing a line somewhere and I’m not an expert to say exactly where that line should or shouldn’t be drawn but there does seem to be a value in drawing that line. John Nakahata: Yes. And I think that – I mean, I think what you described is the general regulatory or deregulatory project that is right. Trying to distinguish areas where the market functions and delivers the sorts of goods that you want and from areas where it does and doesn’t. Classification of course is a clumsy tool in that because [Indiscernible] [01:11:27] the terms of the way the FCC statute or communications accurate because it’s a classification term and it tends to be on off switch. You know, that can only be mitigated to some extent with the application of forbearance. I think the other part of that reality though is that the FCC and the regulators in general, have had a hard time dealing with oligopoly competition issues rather than monopoly competition issues. And so, the regulatory tools were crafted really with the idea of monopoly in mind and don’t necessarily work as well in oligopolistic settings. You know, a good example of this was in the long distance industry where people were concerned at one point about having only a few large players than having group who will be able to use the tariff mechanism for price signal and raise prices in the marketplace among a couple of players. And in fact, that led to the FCC abolishing the tariffing mechanism for the long distance market. So, I mean, it is a – the means by which you control market power from a regulatory standpoint I think are not as clear when you’re dealing with oligopoly. Kevin Werbach: Let me just try and follow up and we’ll get that direct. It would seem to me though at least as a purely descriptive manner, the exercise that the Commission has been undergoing in the last 40 years or so on this issue is predominantly this classification question is in one bucket or the other that they get to these questions that you described, John about the worry about putting it in the regulated Title2 bucket. Whereas, it seems right now both the approach that the Martin Commission took in the Comcast decision of trying to construct some theory under Title 1. And the one that Chairman Genachowski has proposed, the so called third way are attempts to segment to do something more like what Yochai is talking about and say, this is a category things that we should apply once it rules that this is a different category of things. Does that sound right in terms of something that’s at least different in the nature of the enterprise now versus over the historical period? I always love [Indiscernible] [01:13:50] when I’m moderating. John Windhausen: Kevin, let me – I’m sorry, I didn’t quite understand the question if it could be rephrased. Kevin Werbach: The question is, is it fair to say that most of the effort of the FCC – most of the fight on broadband and internet regulation has been about either or Title 1 – information service, largely unregulated, Title 2, telecommunication service traditionally regulated. Whereas now, at least the effort over the last year, both under Chairman Martin and Chairman Genachowski seems to be about can we – can we piece out elements based on market conditions and dynamics that may suggest something more new ones? Or was that what they were trying to do all along? Let’s stamp the panel. Alright. John Nakahata: Maybe that’s what people been doing all along. I mean, you see it in – I mean, like I said, Senator Stevens and Burns talked about use of Title 2 and forbearance, the active debate at the FCC at the time of cable-modem decision and the wireline broadband internet access. So, there was a debate between non-regulated – Title 1 and Title or Title 1 plus some restrictions and information – and Title 2 with forbearance. So, I think it’s just we maybe in the third repeat of the – of the proposal rather than [Indiscernible] [01:15:23] I mean, with some variations at each phase. So, it’s not like everything is completely the same. Kevin Werbach: Okay. Let’s take one or two more of that then wrap up. Kevin Werbach: I’m sorry. Just introduce yourself. Rick Wheat: I’m sorry. Rick Wheat [Phonetic] [01:15:39] with Google. Much of the focus this morning has been on kind of the market power or market concentration type analysis as the basis for drawing lines. I wonder if interest the panel looking at history, the other prongs of common carriers is I think maybe wholesome relevance as well namely, if we can look back in the writings of people like Brett Frischmann and Barbara Cherry and Susan Crawford. There are other elements here in addition to market power. One is this notion that sort of an essential input whether it’s transportation infrastructure or communication infrastructure going back hundreds of years, that’s something to the court and the regulators and certainly, Congress have found to be important considerations. The other is the use of public resources. Rights of way, pole attachments spectrum, which is of course is a national resource. To what extent do you think either this FCC or the future Congress would or should take these kinds of considerations, you know, as it looking to debate the question of how to draw these lines? John Windhausen: Rick, those are all key components of the analysis. I agree that they should be factored into the FCC’s review. I mean, this is I think another reason why it’s helpful to have a comprehensive look at across the board at all of these factors. The common carrier functionality, I mean, that whole concept is really unrelated – the duty to serve everyone is really unrelated to your market power position. I mean, that’s tied you – if you’re offering yourself out to the public, then you have this certain obligation to serve the public and in discriminate way. That’s whether you have market power or not, at least according to that – my understanding of that historical line of thought and that basic principle. So, it’s not just a market power analysis. You’re right. Market power analysis may have more to do with once you define it and categorize it. Okay. How much of the regulations would apply to you in that category? And you can argue that you can adjust the amount of regulation based on the market position. What else? So, the other factors like rights of way, use in spectrum, those also have to be taken into account as well. Kevin Werbach: Alright. Let me ask all of you one – one final question and then we’ll wrap up this session, which is – so, we’ve been talking about history. Let’s whip it around. If we get back together again in say, 14 years, will we still be having this debate or is there – is there a hope that we’ll be on to another – another stage? John Nakahata: Depends on how successful Jessica to con her boss. Jessica Rosenworcel: Well, as a congressional staff, I ought to say that’s above my pay grade. John Windhausen: Well, you’ve probably say this earlier on. I do think we’re likely to be revisiting this question for many years to come because there are two very, very significant important principles that are at stake here and both of them are very valuable. They’ve been with us for many, many years and they’re likely to continue to be of value to us many years in the future. I know in the 1996 Act, what we were hoping, it didn’t turn out this way, but what we were hoping is to create such a – much more competitive landscape for basic telecommunications services that the kind of debates we’re having now would be much different today and in the future. That you wouldn’t have – this market power would not be as much of an issue and maybe we’d only be thinking about the issues that Rick just mentioned and Mark just mentioned before. But we’re not in that universe. So, you know, predictions 14 years from now, will we have a more competitive marketplace than we do today? Well, I hope so. But I’m not ready to guarantee that. I tried that once 14 years ago, it didn’t work. Kevin Werbach: Alright. We’ll bring you all back in 2024. We’ll book this same room if it’s still here. Please join me thanking the panelists for this great discussion.